See more objects with the tag decoration, landscape, domestic interiors, women, wall hanging, house. See more objects with the color dimgrey grey black darkolivegreen rosybrown or see all the colors for this object. This is a Hanging. 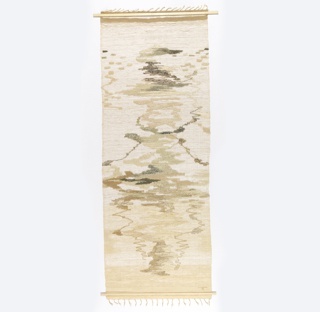 It was designed by Eva Anttila and woven by Eva Anttila. It is dated 1949 and we acquired it in 1964. Its medium is wool and its technique is plain weave with discontinuous weft (tapestry). It is a part of the Textiles department. 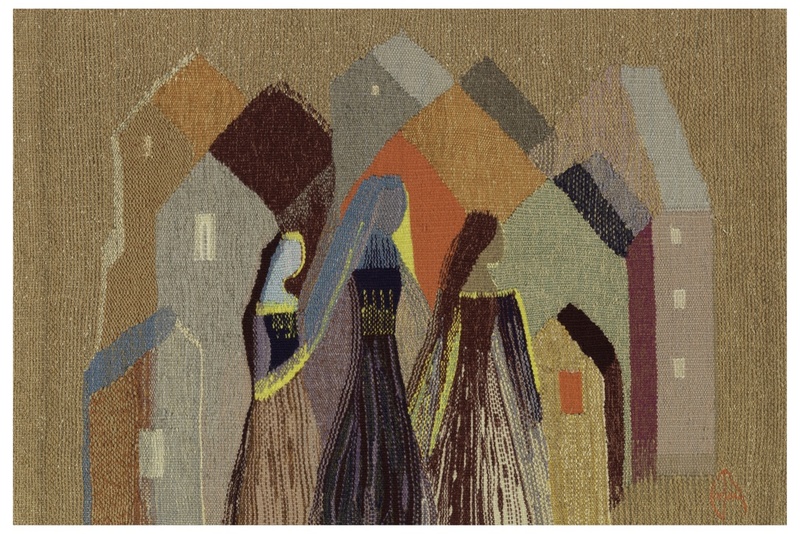 Active from the 1940s through the 1980s, Finnish artist Eva Anttila famously wove, or had a hand in weaving, every tapestry that bears her name. Her work is considered an enduring expression of the “artist weaver” concept, which has its roots in the idealized concept of the craftsman advocated in the German Bauhaus movement, and first articulated in Finland by industrial designer Arttu Brummer, Antilla’s husband. As she explained in an interview published in Finland’s Taide art magazine in 1948, “Tapestry revivals led by painters produce unsatisfactory results – painters only draw cartoons, and their conversion into textiles is left to professional weavers.” A designer, she explains, “…should start by weaving.” With its strong vertical rhythm and stippled shading, Evening echoes these ideas, demonstrating Anttila’s sensitivity to the aesthetics of the woven structure. This object was featured in our Object of the Day series in a post titled Weaving Outside the Lines. This object was donated by Miss Elizabeth Gordon. It is credited Gift of Elizabeth Gordon.